The Dorrance H. Hamilton Public Media Commons is a unique facility, designed to teach the regional community to express itself through digital technology, helping individuals learn to tell their own stories and the stories of their communities through digital video, audio, and new media. The Public Media Commons has added 8,000 square feet to WHYY's 60,000 square feet of studio and office space on Independence Mall. The building stretches from the station's front door on Sixth Street to Seventh Street. The addition will be a hub for teaching audio and video production - for television, radio, and the Web. The new building’s main features include a 4,100 square foot Media Education Studio, two media classrooms, a student-based digital control room, meeting space, and a reception/display area showcasing the latest works of learning lab students The PMC will be part media laboratory, part classroom, part performance and production space, and most importantly, a center for connectivity across the spectrum of media platforms, giving citizens from all walks of life the ability to connect more fully with their own communities. RJC Designs is proud to be a team partner with WHYY in the development of this new facility. 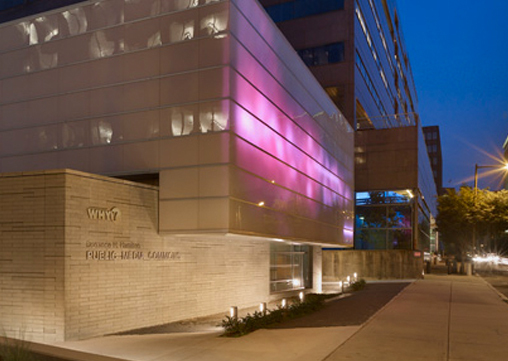 RJC was responsible for the various media and communication designs, related mechanical and electrical coordination, and connectivity designs with WHYY’s broadcast and technical operation center. From project concept and design development through the management of the technology implementation RJC Designs has been an integral part of this educational, technology forward, and community based project.